March Expo Update! 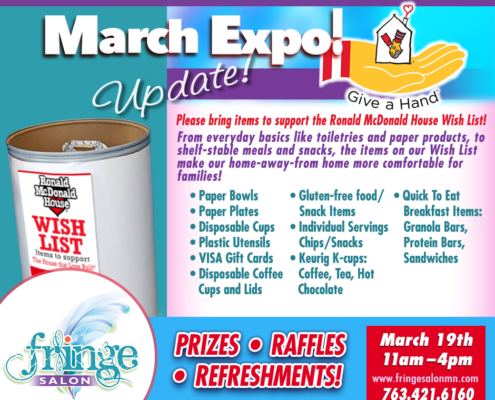 Ronald McDonald House Donations Needed! http://www.fringesalonmn.com/wp-content/uploads/2017/03/RonaldMcDonaldWishList-Fringe.png 788 940 FringeSal Admin http://www.fringesalonmn.com/wp-content/uploads/2014/05/FringeSalonLogoWeb.png FringeSal Admin2017-03-16 13:39:192017-03-16 13:39:19March Expo Update! Ronald McDonald House Donations Needed! 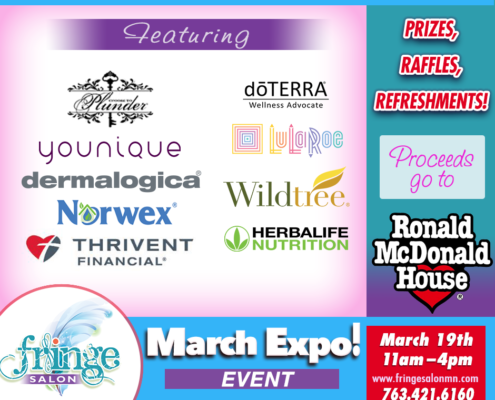 Expo at Fringe Salon March 19th! http://www.fringesalonmn.com/wp-content/uploads/2017/02/FringeSalonMarchExpo.png 788 940 FringeSal Admin http://www.fringesalonmn.com/wp-content/uploads/2014/05/FringeSalonLogoWeb.png FringeSal Admin2017-02-28 12:30:192017-02-28 12:36:26Expo at Fringe Salon March 19th! 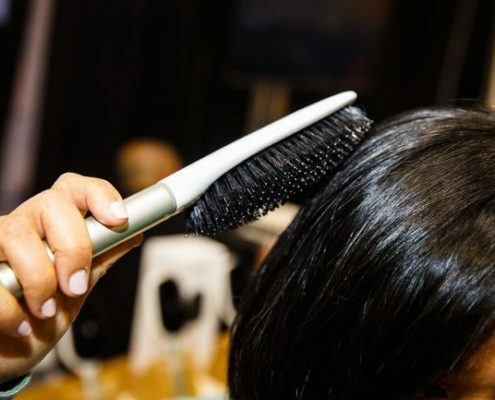 Brazilian Blowouts at Fringe Salon! http://www.fringesalonmn.com/wp-content/uploads/2017/02/BrazilianVideoPlay.jpg 710 1274 FringeSal Admin http://www.fringesalonmn.com/wp-content/uploads/2014/05/FringeSalonLogoWeb.png FringeSal Admin2017-02-14 16:08:302017-02-14 16:08:30Brazilian Blowouts at Fringe Salon! CEAP TOY DRIVE - Today's The LAST DAY! http://www.fringesalonmn.com/wp-content/uploads/2016/12/FringeSalonCeapToyDrive-01.png 788 940 FringeSal Admin http://www.fringesalonmn.com/wp-content/uploads/2014/05/FringeSalonLogoWeb.png FringeSal Admin2016-12-12 06:30:162016-12-05 21:14:29CEAP TOY DRIVE - Today's The LAST DAY! CEAP TOY DRIVE - Only 2 Days Remaining! http://www.fringesalonmn.com/wp-content/uploads/2016/12/FringeSalonCeapToyDrive-02a.png 788 940 FringeSal Admin http://www.fringesalonmn.com/wp-content/uploads/2014/05/FringeSalonLogoWeb.png FringeSal Admin2016-12-11 11:30:342016-12-05 21:14:48CEAP TOY DRIVE - Only 2 Days Remaining! CEAP TOY DRIVE - Only 3 Days Remaining! http://www.fringesalonmn.com/wp-content/uploads/2016/12/FringeSalonCeapToyDrive-03.png 788 940 FringeSal Admin http://www.fringesalonmn.com/wp-content/uploads/2014/05/FringeSalonLogoWeb.png FringeSal Admin2016-12-10 06:30:102016-12-05 21:15:06CEAP TOY DRIVE - Only 3 Days Remaining! CEAP TOY DRIVE - Only 4 Days Remaining! http://www.fringesalonmn.com/wp-content/uploads/2016/12/FringeSalonCeapToyDrive-04.png 788 940 FringeSal Admin http://www.fringesalonmn.com/wp-content/uploads/2014/05/FringeSalonLogoWeb.png FringeSal Admin2016-12-09 06:30:422016-12-05 21:15:28CEAP TOY DRIVE - Only 4 Days Remaining! CEAP TOY DRIVE - Only 5 Days Remaining! http://www.fringesalonmn.com/wp-content/uploads/2016/12/FringeSalonCeapToyDrive-05.png 788 940 FringeSal Admin http://www.fringesalonmn.com/wp-content/uploads/2014/05/FringeSalonLogoWeb.png FringeSal Admin2016-12-08 06:30:172016-12-05 21:15:49CEAP TOY DRIVE - Only 5 Days Remaining! CEAP TOY DRIVE - Only 6 Days Remaining! http://www.fringesalonmn.com/wp-content/uploads/2016/12/FringeSalonCeapToyDrive-06.png 788 940 FringeSal Admin http://www.fringesalonmn.com/wp-content/uploads/2014/05/FringeSalonLogoWeb.png FringeSal Admin2016-12-07 06:30:452016-12-05 21:16:14CEAP TOY DRIVE - Only 6 Days Remaining!